Donald Trump is at the head of the Republican field due, in part, to the strength of support from many self-described “born-again or evangelical” Christians in the early primary and caucus states, according to the exit polls. His success with evangelicals has surprised many observers because of his background; he is a thrice-married man who once described himself as “pro-choice,” and appears not to share some of the beliefs embraced by one of the country’s most socially conservative religious groups. But a new Pew Research Center poll shows that among evangelicals, Trump performs far worse with the roughly two-thirds who are most religiously committed. Whereas half of white evangelical Republican voters who attend religious services less than once a week say they’d like to see Trump get the GOP nomination, just 31% of churchgoing GOP evangelicals say the same. White evangelical Republicans who attend church regularly are most heavily concentrated in the Ted Cruz camp. 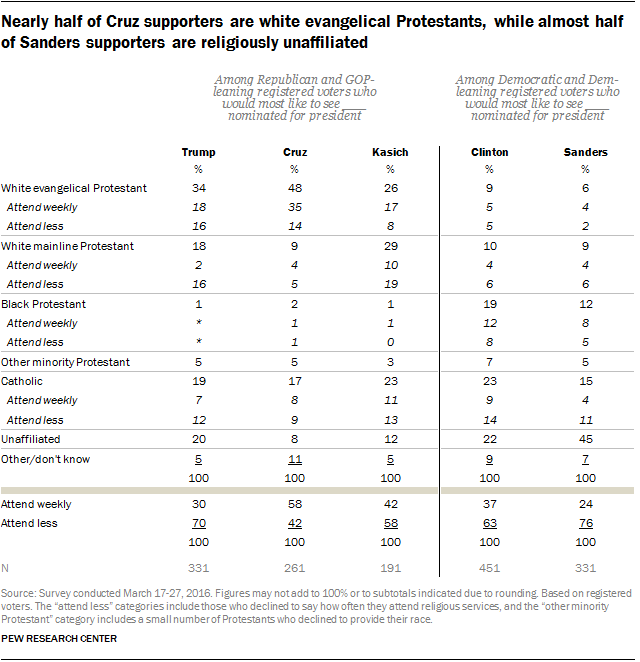 Indeed, roughly half (48%) of Cruz supporters are white evangelical Protestants, and most of them (35% of all Cruz supporters) say they are weekly churchgoers. Smaller shares of Trump (34%) and Kasich (26%) supporters are white evangelicals. John Kasich has a larger share of white mainline (i.e., those who do not identify as born-again or evangelical) Protestant supporters than do the other two candidates. And Trump has more religious “nones” in his camp than does either Cruz or Kasich. Overall, nearly six-in-ten Cruz supporters, regardless of religious group, say they attend services at least once a week. Far fewer Kasich and Trump supporters say the same (42% and 30%, respectively). Much of the discussion about religion and politics in the current campaign has focused on the battle for the Republican nomination. But there also are notable differences in the religious profiles of those who support Hillary Clinton and Bernie Sanders on the Democratic side. Most strikingly, nearly half of Sanders supporters (45%) are religious “nones” – people who identify as atheist, agnostic or nothing in particular. “Nones” are only half as numerous among Clinton’s supporters. For her part, Clinton garners more support from Protestants (especially racial and ethnic minorities) and Catholics than does Sanders. To a large extent, these differences in the religious composition of supporters of Sanders and Clinton reflect Sanders’ comparative advantage among younger Democrats (who are more likely to be religious “nones” than older Democrats), and Clinton’s comparative advantage among non-whites (who are more likely to be religiously affiliated). Among both Clinton and Sanders supporters, fewer than half say they attend religious services on a weekly basis. Still, Clinton’s group of supporters is more heavily composed of weekly churchgoers than is Sanders’ base (37% vs. 24%).